I miss buying school supplies. 😦 I know. I’m such a nerd. But I can be a cool nerd with these Poketo for Target pencil bags! I used to get a new one almost every school year. 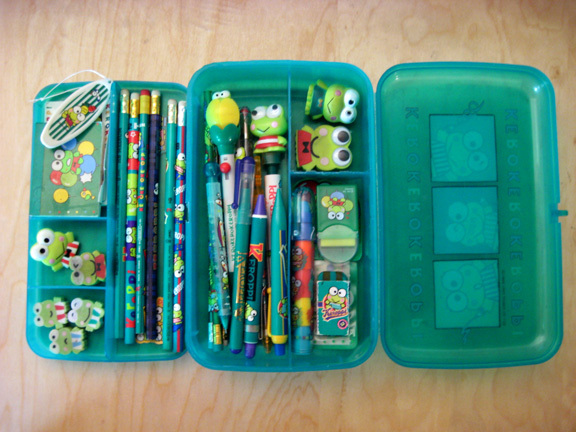 My favorite one was the plastic Keroppi box with the stackable compartment and matching erasers. Oh man. I would have to save up an arm and a leg to afford those overpriced Sanrio accessories. I still remember carrying my plastic Pachacco bag around with my little tin Pachacco pencil case and plastic Hello Kitty wallet. Yeahhh, I’m surprised I never got beat up for such a pencil box geek. I wonder if they still make those musical pencil cases anymore. The ones you can grab at the dollar store and it has a little piano keyboard on the plastic lid. I used to have a yellow one. Gonna check out the dollar store tomorrow and find out. Seeing my little cousin fret over what to bring or what color her Jansport backpack should be and whether or not her friends will have the same lunch hour with her on her first day of high school makes me nostalgic.